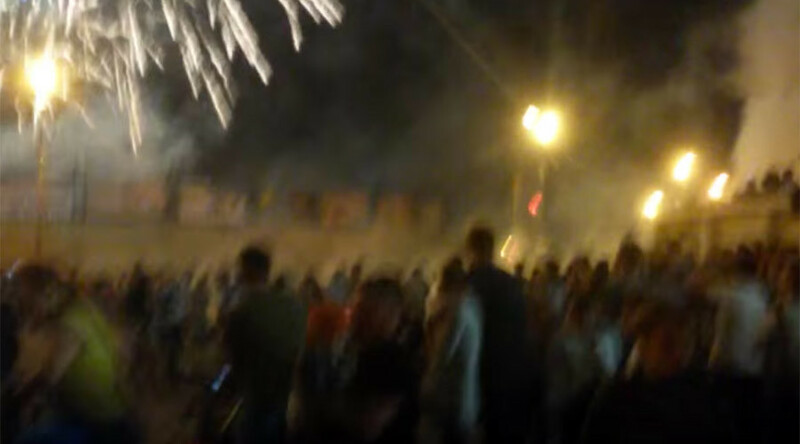 A fireworks display in the Russian city of Dzerzhinsk has gone horribly wrong after a rocket hit the crowd during a local display, killing at least one and injuring six. The incident was captured by witnesses who initially did not realize the scale of the tragedy. Following a full day of festivities to mark the City Day of Dzerzhinsk in Nizhny Novgorod Oblast, at 11:00pm people flocked to the city center to witness a majestic display of fireworks. As the sky exploded into color, one of the charges landed in the crowd of spectators exploding on impact. According to Life.ru, the explosion claimed the life of a local woman. Another ten people were injured with burns and were taken to a local hospital. Several videos documenting the horrific accident were posted online, with many social media users blaming the authorities for failing to adhere to safety regulations when organizing the firework show. As authorities investigate the circumstances of the tragedy local witnesses came out with two versions of the event.